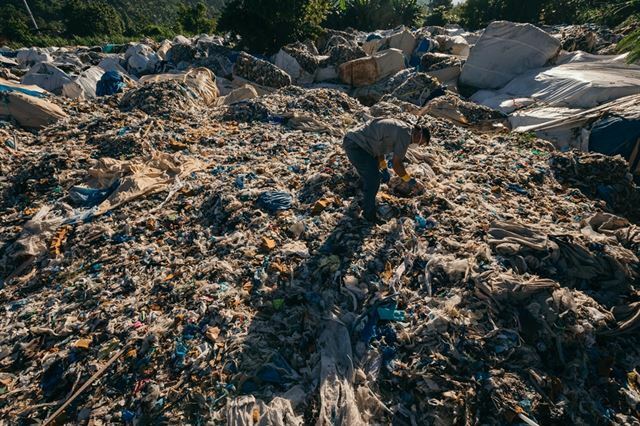 Some 6,500 metric tons of South Korean plastic waste illegally exported to the Philippines will return to Korea, according to local officials and environmental activists Thursday. Some 1,400 tons of the waste, seized and held at the Mindanao International Container Terminal in Misamis Oriental province, will be sent back to Korea as early as late this month, according to officials from the Ministry of Environment. The 51 containers of waste will leave for Pyeongtaek Port on Wednesday, according to a Philippine news report, citing John Simon, port collector at Mindanao International Container Port. The remaining 5,100 tons of waste will be shipped back to Korea later, after being repacked, he said. The return of the garbage comes after a meeting of Korean and Filipino authorities on Dec. 27 and 28, according to the local report. International criticism surfaced last year after a South Korean company illegally exported plastic waste to the Philippines. The company falsely declared the waste as recyclable “plastic synthetic fakes” and exported it on two occasions, in July and October last year. But the waste was not recyclable and included batteries, straws, electronic products, used diapers and medical waste. The Philippine customs office identified the containers filled with garbage in Mindanao in November, and demanded the Korean government take back the waste. The Korean government began administrative procedures to repatriate the waste, which are estimated to cost about $47,000. The government is expected to use the state budget to collect the waste and charge the company later. Much of the world’s unrecyclable plastics are flocking to Southeast Asia after China banned the import of plastic waste. Dumping plastic waste in Southeast Asia, where regulations are relatively lax, is cheaper than processing it here.